In our house, we just love pickles, and pickled okra – such that we can empty a large jar of dills in about one day, and two jars of okra in less than 15 minutes. Same for jelly, peanut butter, soda…and don’t even get me started about the wine. Although we could recycle the jars and bottles, upcycling crafts are fun! And yes, mason jars are also popular, but preferable to me are jars that are a blank canvas – without the raised lettering that can interfere with the design. So collect those jars and bottles and get creative – from decor to storage to lighting to drinkware – glass jar decorating ideas are so plentiful it will boggle the mind! Consider how you’d like to use the jar in decor. Do you need some bathroom storage for makeup, cotton swabs, cotton balls or bath salts? In that case, small or medium-sized jars would be appropriate. What about the kitchen or pantry? Stashing foodstuffs and staples is common – and if the effort is bulk storage – large jars are best. Small to medium-sized jars or bottles are great for drinkware, while the larger ones are perfect to support a lampshade or houseplants for a clever terrarium. Have a thousand baby food jars? They’re great for storing the millions of tiny things – like earring backs, picture nails, and paper clips – that seem to find their way to the bottom of every junk drawer. As myriad as the ideas for glass are the finishes and treatments available. Glass may be painted, decoupaged, stained, etched and cut. It will accept adhesive and may be covered in fabric, glass jewels, paper, findings or cording. Additive products, like clay, silicone or wood turnings may be applied to create sculptural effects or raised lettering. Accompanying metal lids may also be kept and crafted in much the same way, topped with knobs, decorative figurines or finials. Finally, incorporating a wood base or decorative stand could refine and stabilize the piece – and no one would ever know that, just yesterday, it held pickled okra. Here are some ideas and tips, by room, that might inspire you to keep and upcycle those bottles and jars. Apply desired media to glass, paint lid, apply finial or knob, handle or figurine to the lid. For a writable label, paint a square section with chalk paint on the front of the jar. Or for something more permanent, write “flour” in hot glue on the outside surface, allow to dry, then paint. Screw baby food jar lids to a plank – suspending the jars – to display and store dried spices under the pantry shelves or cabinets. Glue the jar on a decorative candle plate or pedestal, or construct your own with an unfinished wood plaque base and wood-turned footings. To make your own drinkware, try this bottle cutter tool. Tips: Use washable, non-toxic media for glass that is safe for food storage and consumption. Large jars are best for high-use pantry bulk items. Use medium jars for items not used in volume, and for both – cut original package label with lot number, expiration date and UPC code – and keep in jar for freshness and recall reference. Create apothecary jars for cotton balls, swabs and bath salts. Fill painted jars with aquarium rocks, decorative gravel or coffee beans to keep long-handled makeup brushes upright and accessible. Retrofit a mason jar with a pump top kit for lotions and soap. Tissue holder – replacing the flat metal lid with leather and cardboard dispenser sleeve. Here’s a great tutorial! Wire handles for jars can be purchased; hang from towel bar with S-hooks, and use for storage or decor, or fill with fragrant salts, soap shavings, beads or powders. Tips: Retain lids whenever possible to keep dust and moisture out. Keep away from splashing water and soap spatter, unless obsessive wiping is preferable (not in my house, it’s not!). Apply translucent stain to baby food jars, affix to a finished decorative plank (right side up), and place an electric tea light in each for an interesting coffee table fixture. Tips: When enclosing a light bulb in a jar, avoid dangerous overheating by ensuring the bulb is a small size and is LED or low wattage. Create miniature dwellings or seasonal scenes in larger jars (dioramas). Any sized jar may be used for terrariums, as long as the plant fits! Slide favorite photos in jar against the glass, to use as a photo frame. Paint or decorate the outside of the jar around the photo. 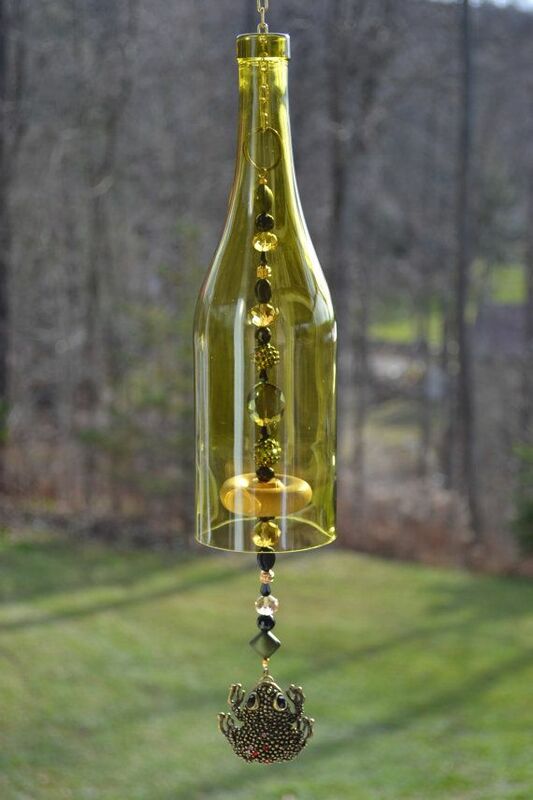 Wine bottles are also great for wind chimes; here’s a lovely example. You’ll need a bottle cutter tool for this project, too. Tips: Plant roots don’t do well sitting in water unless they’re water lilies. Experts differ on the efficacy of using a pebble layer at the bottom of a plant container without drainage holes. I have always used a layer of small pebbles and have never had any problems; just don’t overwater. When designing a terrarium, remember: 1) succulents and cacti don’t do well in moist environments (so keep the lid off) and 2) select plants with the same light and water requirements. Save Those Jars and Bottles! Whether you enjoy pickles or wine, or pickle-flavored wine (is that a thing? ), the empty vessel can prove to be a beautifrugal upcycle. Keep them out of the landfill – consider some of these glass jar decorating ideas – and have some DIY fun! Do you have an example of glass jar decor you’d like to share? Post it in the comments…we’d love to hear from you! Interior Decorating Styles – Which Style Fits You? I love the lighting ideas and jars for plants. So cute! Thanks for the ideas! Thanks, Erin…from one Eco Girl to another…love your site, too! Thanks for the share! And if you have any other great ideas about which you’d like me to post, reach out! My Budget Home Decor © 2019. All Rights Reserved.